Charlie and I made this for the first time on 1/1/11. 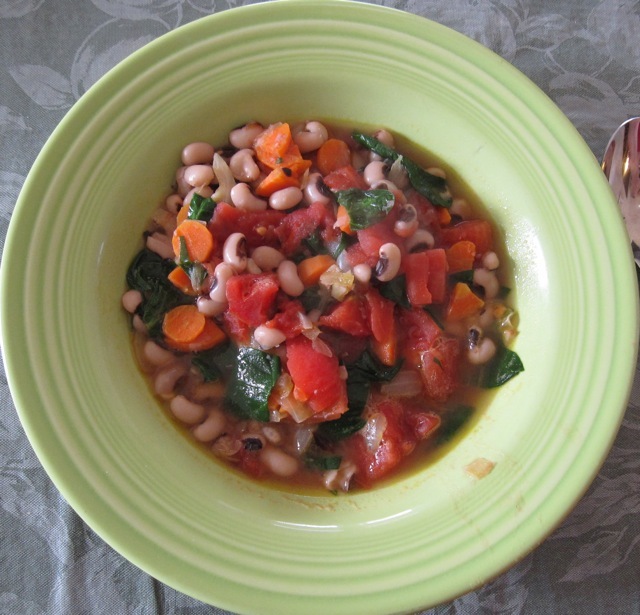 It's traditional in the south to eat black-eyed peas on New Year's Day for good luck. I think it's also traditional to season with ham, but we didn't have any so we used what we had and the stew turned out surprisingly good. This is a simple/easy dish. Don't let all the words below put you off. I can't seem to write recipes with few words. Quantities below are approximate. Feel free to adjust. Serves 8 or more. Don'tincrease this recipe unless you are feeding a LOT of people. If you think of it, cover the peas with water and soak overnight. This is not necessary but speeds up cooking time. If you soaked the peas overnight, drain off the soaking water. Put the peas in a large pot with the chicken broth. In a skillet, saute the onions and carrots in oil till carrots are just starting to get tender. Add the garlic to the skillet and cook a few minutes more. Add the spinach to the skillet and cook till it is wilted. Just a minute or two. To the peas, stir in the tomatoes, salt, pepper, and the onion/carrot mixture. Taste and add more salt/pepper if desired. Probably would be fine with pre-cooked canned or frozen black-eyed peas. Certainly faster and easier. For a less vegetariany version, cook beans with ham or bacon drippings or ham hock. Or, add pre-cooked chopped ham or sausage at the end. Use kale, beet greens, mustard greens, or other greens instead of spinach. Most greens will need to be cooked longer than spinach, some much longer, so put in before carrots get tender. Serve with grated cheese on top, e.g., parmesan, romano, cheddar. But we didn't use any cheese and didn't miss it. Experiment with seasonings: red pepper flakes, curry, chile, basil. Probably not all these at once!